Martin is moving around all over the place and getting into everything within his reach. 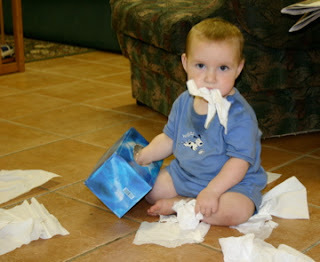 Last night he was caught testing the effectiveness of the tissue box. On Sunday we emerged from our home, blinking in the sunlight, rejoicing that a new week has begun. The stomach bug thingy went through everyone except for me, but I was home by the end of the week helping maintain order while Lana took much needed time to recover. The weather outside of rain, fog and general dullness matched the mood inside rather well. But once we saw the sun had come out to rejoice with us, on Sunday after Mass we went for a drive and play in the park just to enjoy the Spring day. This is Rose, asleep on the toilet lid. She has been watching Clare and thought it would be a good idea if she was sick. That would mean some lemonade and watch movies. So she told us she was sick. But she did not look at all ill the way she was jumping about. Then she went to the toilet and was sick everywhere but the bowl. OK. So NOW she was officially ill. This morning she said, "I'm not sick now." and she stood next to Lana and I as we were in my office doing some work on the computers. Then she burped and looked at us and exploded. Luckily just on the floor and not the desk. So we cleaned up again and set her on the lounge. "Don't wanna bucket." she said to us, "I'm not sick." So she went to the toilet and lay over it. Not long afterwards she fell asleep as you see here. Meanwhile last night Clare fainted when she stood up for our nightly prayers. 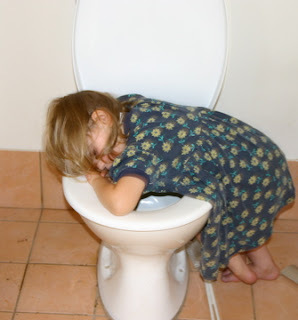 "I fell asleep standing up," was how she described it later to Grandma. Well, it's gradually going through everyone. 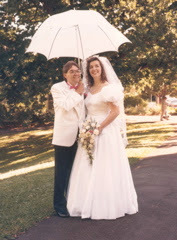 Lana and I are celebrating our 18th wedding anniversary. We had planned a special dinner for all of us and a few other special activities. But this will all have to wait a week or so as the vagaries of family life have intervened in our plans. Eric has some stomach bug which has kept him close to the toilet for the last few days but he was the only one and no one else looked off colour. Then it stormed beautifully yesterday and all the children went playing in the rain. Unfortunately Ariel slipped and twisted her ankle so we had to rush out into the rain and bring her in and tend to her injuries. She is not as small as she used to be! Then last night Clare came into our bedroom at 2am and said she wasn't feeling well. "Go to the toilet!" we instantly instructed her and I leapt out of bed and carried her in the right direction. Almost! She exploded about 1 foot in front of the toilet. When she had finished we washed her up and settled her back into her bed. I cleaned up the toilet and parts of the bathroom. Lana is still tired as Martin is getting more teeth and not sleeping well. At 3am Clare woke up again and didn't even make it out of her bed. So this time Lana and I both got up, replacing bedding and settling Clare down. At 4:30 am she once more awoke, but this time used the bowl we had given her and Lana tended to her. I slept through this one! Eric helped in the last two episodes, and Ariel woke up and felt bad because she couldn't get up and help out. "You can cheer us on" suggested Eric. So today is the day we had planned to celebrate our Anniversary, the closest Sunday. And we can't even go to Mass without risking the spread of our stomach bug. Until death do I part. That was the deal. And once we really understood that love is really a matter of intellect and will more than just a feeling, life is good. Reading the pages of our adventures on this blog gives you a flavour of family life, but there are so many good things that still get left out of our memoirs. The big smile Rose and Clare give us in the morning, the assistance and companionship of all the children, the joys we all share when any of the children achieve a milestone - crawling, walking, talking, test scores, whatever. So for us, this IS a happy anniversary. 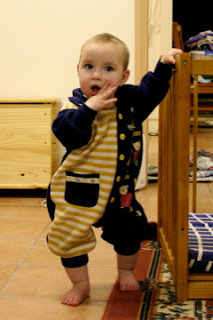 There are several stages of home defence as a baby gains greater mobility. Defcon 0 - You can leave the baby in one spot and you know he will be there when you return. Defcon 1 - He is rolling so no more leaving him on a bed or spot where he can roll into danger. Defcon 2 - Crawling! Everything up higher and watch where you are walking and running, especially if your arms are full. Defcon 3 - Walking. Godzilla time. The baby will wander anywhere at any time, pick up whatever is in reach and place it straight in his mouth. Favourites include delicate Lego creations and train sets. And dirt. Lots of it. Defcon 4 - Climbing. Batten down the hatches. This photo is from this evening. Martin at just over 6 months and is crawling and now pulling himself up. Any fingers in reach - ready or not - are grabbed by Martin and held tightly expecting a walk with his arms raised high. Grandma and Opa are favourite victims. Yesterday Clare and Rose decided to clean up their cubby house. This involved using broom, dustpan and brush and rearranging all the furniture. 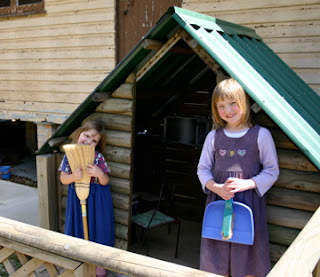 Satisfied with their work, Clare went up to Lana and said, "Can you look at our cubby house? I cleaned it up. It needed a woman's touch." Over dinner that night I asked Clare where she had heard that phrase. I knew it was a phrase we didn't use around home. "Calamity Jane. She said it when she cleaned up that house." We haven't watched Calamity Jane for some time. It is amazing what the children remember and apply at appropriate moments. One morning this week Rose stumbled in to us half awake looking like this. Her face was covered in texta (marker pen). Rose offered no explanation other than a blank half smile. Luckily it washed off reasonably easy. In other child news, Clare was listening when I explained that we would go out as a family for our wedding anniversary, as the children were the fruit of that decision. That evening when we were discussing where we would go Clare announced, "I'll carry the fruit." "The fruit of your anniversary. I'll carry it." Clare explained. "Ah no, Clare," I said, "YOU are the fruit." Sometimes the children are a bit too literal in their misunderstanding.